Once again Kurt and I took advantage of the vacation and decided to wake up late. We packed up and checked out at noon as required then headed back to the beach to enjoy some sun. 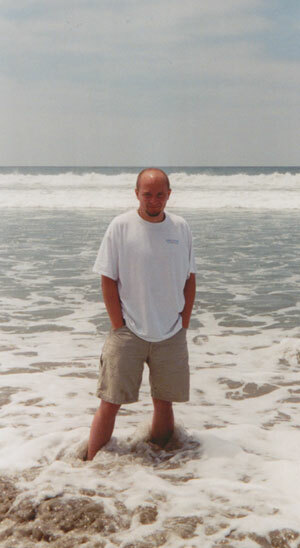 Kurt and I waded in the surf and walked up and down the coast for about an hour. For lunch we found a small grocer about half a mile from the shore and purchased some fresh California fruit; strawberries, cantaloupe and kiwi made for the perfect lunch. Kurt and I decided we should think about finding our way back to Las Vegas since our plane departed in about 24 hours. Consequently, we headed back through Escondido, CA and caught Interstate 5 North. We decided avoiding LA would be most conducive to our traveling pleasure. The scenery through the mountains was once again very interesting to look at. We seemed to be making good time until we reached yet another Boarder Patrol station; this one was in the middle of the state, not right on a boarder. Once again, the officer simply asked us where we were from and where we were going. We weren’t so sure the folks in the cars behind us would appreciate us telling the detailed story of where we were from and where we were going so we made something up. The important thing was we didn’t have any illegal immigrants hidden in the car. Our next planned stop was Palm Springs. However along the Interstate, we suddenly saw an old air museum with tons of old warplanes surrounding the building. Kurt and I decided we had to stop. We ended up spending a couple of hours wandering around inside and outside, admiring the variety of historic fighters and bombers. Before we knew it, it was 4pm! We hopped back in the car and headed on towards Palm Springs. As we were coming over a mountain right before the city, the fields beside the road were suddenly inundated with hundreds of wind turbines. They were everywhere. It was a strange sight to see so many of them, in every direction as far as you could see. We tried to snap a few pictures of them, but unfortunately there was no where to really stop. We finally arrived at Palm Springs and decided we needed gas and food – not necessarily in that order. We found a placed called El Ranchito Taco Shop – fast food – but a Mexican restaurant none-the-less. After filling up and gassing up, Kurt and I headed back towards the Interstate. We got to see a little of Palm Springs and its suburbs and we were unimpressed. We can’t imagine why you’d like to go there unless all you want to do is golf. Eventually we reached Joshua Tree National Park. Kurt headed the Sunfire through the South entrance with the full intention of driving only a short distance into the park, then turning around to catch the Interstate again. So consequently, we drove right on past the self pay station – the fee was rather steep anyway. We stopped at the first self-guided hiking tour; it required us to walk about half a mile. Along the way were signs detailing the plant life at this particular elevation in the desert. Kurt and I began to realize how much the foliage changed with the elevation in the desert. We didn’t see any Joshua Trees, however. Kurt and I moved on through the Park, stopping at each of the educational signs to learn about the desert and the life therein. By the time we’d made it halfway through the Park, about 25 miles or so, we decided that it would be best just to continue on all the way through the park and pick up the highway on the other side instead of going back to the Interstate. Ultimately, we would come out at the same place anyway (the Arizona-California border). On our drive through the park, Kurt and I saw a lone coyote off the side of the road. We also came upon a very different and strange looking cactus, called the cholla catus. Its nickname is the ‘teddy bear’ cactus. They seriously looked so soft and squeezable that I just wanted to hug them (not a good idea, I know). These cacti reproduced by dropping the ends of their branches, little balls, onto the ground. These little balls then take root and start a new plant. We stopped in a valley filled with these cacti and walked along a short path. It was really beautiful seeing the cholla cacti as far as the eye could see. These cacti alone were worth stopping in the Park. 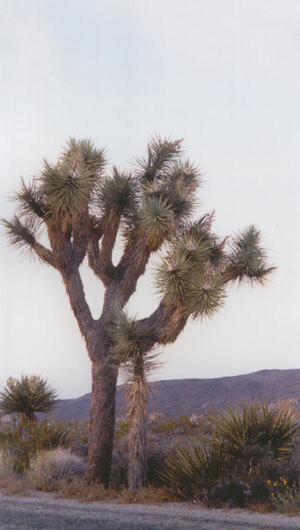 However, we still hadn’t seen a Joshua Tree, and that’s why we came in the first place. There were also interesting rock formations in the Park – large round boulders stacked on top of each other. They just didn’t look natural. Finally, we came up over a hill and pulled off to look at another sign. This sign told us that we were leaving the Colorado Desert (the hottest and driest desert in the US), a subdesert of the Sonoran (which we’d been in since leaving the mountains of northern Arizona), and entering the Mojave Desert, whose primary characteristic is the Joshua Tree. The Mojave is the highest desert in the US. The Joshua Tree needs this elevation in order to grow. Sure enough, we looked across the road and there was a field of Joshua trees! They were a gorgeous sight. We had planned on camping here the previous night until we changed our minds and headed to Oceanside. I wish we could have camped in the Joshua Tree National Park, it is truly a beautiful place. However, the night before we were just plain tired of camping still! We headed out of the Joshua Tree National Park fully satisfied. As we continued driving through the desert, we saw a sign saying that the next service station was 100 miles. Thankfully, we still had enough gas. Kurt and I noticed that there were very run down shacks, all about the same size, every ½ mile or so for a good 30 miles. We wondered why – was this an Indian Reservation? Had it been a mining area long ago? We saw a few shacks that were still inhabited and wondered how anyone could live in the middle of such a harsh environment, miles and miles from nowhere? We did get to see an incredible sunset, though. And once the sun had fully gone down, we pulled off to the side of the road, a full 50 miles in any direction from the nearest civilization, and admired the stars. Neither of us had ever seen so many. They filled the sky to the point that we couldn’t even pick out any constellations. We even saw at least 5 satellites. It was astounding. After being mesmerized for about ½ an hour, we headed onward. We eventually crossed the Colorado River into Arizona and headed North along the River to a town called Lake Havasu City, whose claim to fame is the original London Bridge. In the 1970’s Lake Havasu bought the bridge from England and had it disassembled and rebuilt in the desert. They even built a canal beneath it for water. As we wound through the hills and bluffs, we really wished it was light enough to see the river. It must be beautiful through there. The river is actually dammed at several locations along this stretch, forming recreational (and functional) lakes. Then we decided we were hungry. Unfortunately, the only place we could find open at 11pm in this tiny town was a Denny’s. We stopped and both Kurt and I got our daily intake of grease. Yum.